Accidents involving semi trucks and tractor-trailers are different from accidents involving passenger vehicles (cars, light trucks and motorcycles). There are a host of laws that relate specifically to the interstate trucking industry and commercial vehicles. There are laws specifically for commercial drivers. And the dynamics of truck accidents are different as well. 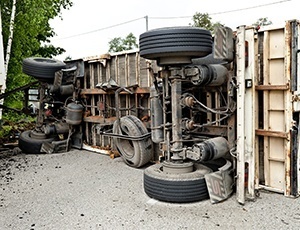 After a truck accident with injuries, an investigator will be looking for evidence relating to the truck, the driver, and even the trucking company. It's wise to work with a law firm that has experience handling these kinds of accident cases. At The Law Offices of Suizi Lin, we have accident investigators on staff who will go to the scene to gather evidence, interview witnesses, and get the facts. We will ensure the evidence is preserved so your case can be proven in court. If you or a loved was injured in a truck collision or semi-trailer crash, contact a lawyer as soon as possible. We have the resources, we know the laws, and we have a solid track record of results in all sorts of personal injury cases. Was the driver fatigued? Had he work too many hours or driven too many miles. We investigate the drivers' log book — and scrutinize the accuracy of that log. Did the driver have a history of accidents or traffic violations like speeding or reckless driving? Has he had any drunk-driving convictions? Was he using drugs or alcohol at the time? Was the load properly fastened or contained? If the truck was carrying hazardous materials (hazmat), were they properly contained or stored? Was the truck overweight? Was the cargo properly loaded so that the truck was balanced? Had the vehicle been properly maintained by the company? Are there inspection records? Has the company had problems with its hiring and training of big rig drivers? We have the knowledge and resources to take on the large insurance companies. We have the experience needed to prove fault. Contact our Hayward, California law office online or by calling (510) 689-1988 to schedule a consultation.